Learn how to judge diamond quality! Many women wear their engagement rings for the rest of their lives, so it's very important to choose from well made, quality engagement rings. Learn how you can tell whether a ring has the quality you expect and deserve. Educating yourself about these components is important. Knowing about quality jewelry will make you a better shopper and negotiator, and you'll end up with a better engagement ring because of your research. These days, engagement rings can feature the traditional diamond solitaire, several diamonds, or other special gemstones. When you're shopping for your ring, be sure to pay close attention to gemstone quality. Since the gemstone is the most valuable part of many engagement rings, this is where doing your homework really pays off. Color: With the exception of fancy colored diamonds, the most valuable diamonds feature the least color. Jewelers use a color rating scale to establish diamond color, and when you buy a diamond, this information should be provided. Cut: The cut of a diamond refers to the diamond's proportions. This is not the same as a diamond's shape, which has less effect on value. It takes a skilled craftsman to cut a diamond, and the resulting stone needs to have just the right depth and number of facets. Clarity: A diamond's clarity is another important factor in determining its value. The most valuable diamonds are free of visible inclusions or flaws, while most diamonds have small flaws that may not be visible to the naked eye. Your jeweler should show you the diamond under a microscope and point out any inclusions. Carat: When it comes to quality, the carat of a diamond is the least important consideration. Carats are a measure of weight, and heavier diamonds are often larger. The size of the diamond will affect its value, but it will not affect the quality of the stone. If you consider an alternative to the diamond engagement ring, it's just as important to consider the quality of other gemstones. In general, the most valuable stones contain the least flaws, and it's important to make sure the gemstone is cut in a favorable way. Depending on your choice of stone, you may also want to consider color. For instance, certain shades of sapphire are more valuable than others. Settings come in all shapes and sizes, but they should provide a snug and protective home for your gemstone or diamond. Make sure the stone is very secure. Be sure prongs or gemstone contact points are even and attractive. There should be no gaps or rough areas. Consider choosing platinum for your diamond's prongs. Since this part of the ring is the most important and receives the most abuse, you want the strongest metal. 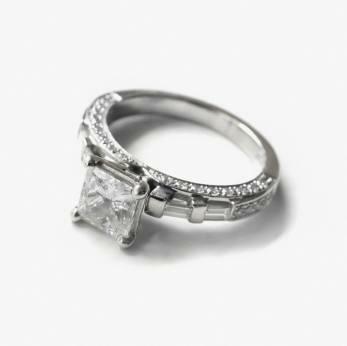 If your setting has an elaborate design, you may want to have the entire ring made of platinum. When choosing a setting, also consider the stone. If your gemstone is softer than a diamond, a more protective setting will make a better quality ring. In this case, look for a bezel setting, a flush setting, or another low-profile choice. Well made, quality engagement rings will be heirloom items treasured by generations to come. Educating yourself about gemstone and setting options will make it easier for you to navigate the sometimes overwhelming array of engagement ring designs.